As many as one-third of college freshmen leave school during or after their first year. While some students change schools to be closer to home or find a more affordable institution, other students who struggle with studies and adapting to student life drop out completely. Transitioning from high school to college is a major shift for many teenagers. Not only do college freshmen confront a new and different daily schedule, but they are also reckoning with a newfound freedom. Much as a teenager longs for freedom, it’s often a big wake-up call when Mom and Dad are no longer looking over his shoulder, making sure he studies and gets to class. Tip #1: Go to class. Some college freshmen are under the impression that class is optional and that catching up is easy. While professors may not take attendance and may even say attendance is not required, not showing up for class is the quickest way to earn a failing grade. In fact, going to class is the most crucial aspect to doing well in college. The more time a student spends in class, the less time she needs to spend studying outside of class. The best advice for college freshmen is to treat their college education like a job and show up — on time, every time. Tip #2: Be prepared to feel overwhelmed. It’s not uncommon for college freshmen to feel anxious, uncertain, and awkward. In preparing for college, help your student understand that there will be times she will be feel unprepared for the many changes that are part of the next stage in her life. Help her discover ways to lessen those overwhelming feelings by encouraging her to attend every orientation event and learn her way around campus before classes start. It’s often a long walk between buildings, and freshmen taking the intro courses may have classes in several different departments housed blocks — or even miles — apart. Tip #3: Practice being organized. In high school, some teachers and parents help students stay on top of assignment due dates and remind them to study for exams. In college, professors map out the entire semester and expect students to manage the due dates on their own. Organization is the key to knowing when assignments are due and where all relevant study materials are located. Encourage your student to use organizers to keep class notes and printouts neat, and show him how to use a calendar for daily planning. Tip #4: Find a mentor or two. Your college freshman is going to have obligatory meetings with her advisor, but she should also feel encouraged to meet with her advisor whenever she needs advice or guidance. It’s incredibly beneficial to form a meaningful student-teacher relationship with professors. Stopping by a professor’s office in between classes to ask questions or get feedback demonstrates that the student is invested in learning and doing her best. In turn, the professor is more likely to become invested in the student’s education as well. Tip#5: Create a balance between academics and socializing. Many college freshmen feel an extreme amount of pressure to study night and day to get a high GPA. It’s important to remind your teen that college is helping him prepare for the real world, and a highly employable person is one who is both sociable and relatable. Beyond that, your teen is coming of age and should embrace interacting with peers who are in the same life stage. Becoming involved in a campus extracurricular organization related to the student’s interests is one way to meet others who are both motivated and well organized, and who also are seeking to simultaneously balance several life areas. Encourage your student to seek out such involvement early in his or her college career. Personal connections made through extracurricular involvement can translate to community support when facing the challenges of college life. Finding one’s “tribe” will help your student feel more connected to campus as a “home away from home” and more likely to be committed to attending college through graduation. That said, balance is important. Peer pressure isn’t exclusive to high school, and the pressure to socialize can be overwhelming. (Not surprisingly, the biggest partiers are rarely around for graduation.) It’s easy for some students to get caught up in the party scene without Mom or Dad around to remind them to get that homework done. Before your student goes off to college, make sure you set expectations about how much socializing is too much. In case his grades start to suffer when your former bookworm blossoms into a social butterfly, it’s good to have agreed ahead of time on an action plan you both can stick to. Tip #6: Learn how to deal with roommate issues. Typically, college freshmen don’t get to choose their roommate(s). Sometimes freshman roommates become fast friends. Other times, however, their personalities and habits clash. When preparing for college, talk to your teen about addressing any roommate issues in an open manner instead of letting them smolder. This is a great opportunity to teach conflict resolution skills that will be applicable to many other situations throughout your child’s life. 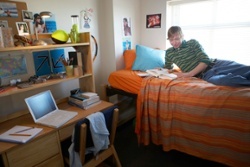 And, if the situation gets out of control, help your child to seek assistance from the residence hall staff; it’s a wise first step that often leads to an equitable solution for both roommates. Tip #7: Take care of mind and body. Talk to your teen about the importance of making time to take care of herself. She should wake up in enough time to eat breakfast and also get plenty of rest. Encourage her to opt for healthy foods instead of the junk foods that might be more readily available. Also encourage her to continue to take part in activities that have always helped her relieve stress and relax. Whether it’s a yoga class or simply watching her favorite TV show, budgeting time for a stress-busting activity can help her unwind and wake up refreshed for another day of classes. Freshman year of college is a time when your student is laying the foundation of her study habits, campus life, and ability to handle challenges on her own. In preparing for college, talk to your child about what to expect and help her plan ways to handle situations that are common to all college freshmen.